Smart Director is an integral component of the Continental Computers funeral home management suite. This particular software primarily focuses on helping funeral home businesses deliver high-quality customer service to their clients. It gives them a web-based platform where their clients can submit service requests, queries, and other communications for other needs. With Smart Director, you are able to address all your customers’ needs and queries and address them as quickly and efficiently as possible. It integrates seamlessly with other Continental Computer death care management suite, making it a leading funeral home management solution in the United States. Smart Director by Continental Computers provides funeral homes with a comprehensive business management system with a primary focus on top class customer service. It is equipped with a user-friendly interface that simplifies and streamlines funeral home processes and workflows. But its main highlight is its customer service capabilities. Users give their clients an online portal where they can submit service requests, queries, and more without ever picking up the phone. Smart Director simplifies the management of service requests, allowing you and your team to address requests and needs of your clients in the timeliest manner, ensuring that their issues are met and satisfied at every instance. Smart Director by Continental Computers parades a long and robust list of features, including sales contract management, forms management, customer account maintenance, decedent management, trust management, export to third-party accounting, and more. It also integrates smoothly with other Continental Computer systems such as Cemetery Software, Crematory Software, and Funeral Home Accounting system to mention some. Smart Director is web-based and can be utilized and accessed anywhere in the world as long as you can connect to the web with an internet-capable device. This flexibility gives you total control over your business, allowing you to fully and efficiently manage your resources and time, handle your business, access information that will help you come to data-driven decisions. What Problems Will Smart Director Solve? 1. Most of the Multinational companies have the problem in Customer Management. Smart Director Software helps to sort out the issues. 2. Funeral Homes Companies have a difficulty in Managing the Cremation and Cemetery records. 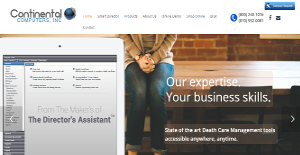 But The Smart Director is a complete funeral home management system to help the death care industry. If you are interested in Smart Director it may also be a good idea to analyze other subcategories of Best Business Process Management Software listed in our database of B2B software reviews. There are trendy and widely used systems in each software category. But are they automatically the best fit for your company’s specific needs? A popular software solution may have thousands of users, but does it present what you need? For this reason, do not blindly spend on popular systems. Read at least a few Smart Director reviews and consider the elements that you want in the software such as the fees, main tools, available integrations etc. Then, select a few systems that fit your needs. Try out the free trials of these apps, read online reviews, get information from the maker, and do your research systematically. This in-depth groundwork is sure to aid you find the best software application for your organization’s specific needs. How Much Does Smart Director Cost? Contact Continental Computers for enterprise pricing information and other product details on Smart Director. You can also submit a request for a demo to see if the software is a perfect fit for your business. We realize that when you make a decision to buy Business Process Management Software it’s important not only to see how experts evaluate it in their reviews, but also to find out if the real people and companies that buy it are actually satisfied with the product. That’s why we’ve created our behavior-based Customer Satisfaction Algorithm™ that gathers customer reviews, comments and Smart Director reviews across a wide range of social media sites. The data is then presented in an easy to digest form showing how many people had positive and negative experience with Smart Director. With that information at hand you should be equipped to make an informed buying decision that you won’t regret. What are Smart Director pricing details? What integrations are available for Smart Director? If you need more information about Smart Director or you simply have a question let us know what you need and we’ll forward your request directly to the vendor.